* A Bezier segment consists of four Point objects that define a single cubic Bezier curve. 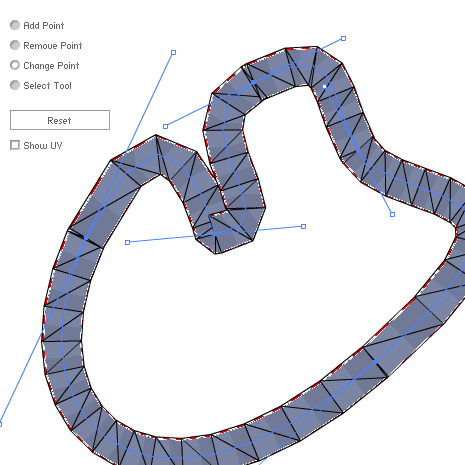 * The BezierSegment class also contains methods to find coordinate values along the curve. * Calculates the value of a one-dimensional cubic Bezier equation at a specific time. * and uses two of these equations, one for the x coordinate and one for the y coordinate. * @param t The <code>time</code> or degree of progress along the curve, as a decimal value between <code>0</code> and <code>1</code>. * @param a The first value of the Bezier equation. * @param b The second value of the Bezier equation. * @param c The third value of the Bezier equation. * @param d The fourth value of the Bezier equation. * @return The value of the Bezier equation at the specified time. * given the values of the corresponding cubic Bezier equation. * which are the coefficients for a cubic polynomial. * so the first number in the array would be multiplied by t^3, the second by t^2, and so on. * Finds the real solutions, if they exist, to a cubic polynomial equation of the form: at^3 + bt^2 + ct + d.
* This method is used to evaluate custom easing curves. * @param a The first coefficient of the cubic equation, which is multiplied by the cubed variable (t^3). * @param b The second coefficient of the cubic equation, which is multiplied by the squared variable (t^2). * @param c The third coefficient of the cubic equation, which is multiplied by the linear variable (t). * @param d The fourth coefficient of the cubic equation, which is the constant. * @return An array of number values, indicating the real roots of the equation. * There may be no roots, or as many as three. * Imaginary or complex roots are ignored. * Finds the real solutions, if they exist, to a quadratic equation of the form: at^2 + bt + c.
* @param a The first coefficient of the quadratic equation, which is multiplied by the squared variable (t^2). * @param b The second coefficient of the quadratic equation, which is multiplied by the linear variable (t). * @param c The third coefficient of the quadratic equation, which is the constant. * There may be no roots, or as many as two. * Constructor for BezierSegment instances. * @param a The first point of the curve, a node. * @param b The second point of the curve, a control point. * @param c The third point of the curve, a control point. * @param d The fourth point of the curve, a node. * The first point of the Bezier curve. * It is a node, which means it falls directly on the curve. * The second point of the Bezier curve. * but usually does not pass through it. * The third point of the Bezier curve. * The fourth point of the Bezier curve. * Calculates the location of a two-dimensional cubic Bezier curve at a specific time. * @return A point object containing the x and y coordinates of the Bezier curve at the specified time. * Finds the <code>y</code> value of a cubic Bezier curve at a given x coordinate. * resulting in more than one <code>y</code> value for a given <code>y</code> value. * In that case, this method will return whichever value is most logical. * Used by CustomEase and BezierEase interpolation. * @param x An x coordinate that lies between the first and last point, inclusive. * values that are the same everywhere on the curve and do not need to be recalculated for each iteration. * @return The <code>y</code> value of the cubic Bezier curve at the given x coordinate. // Clamp to range between end points. // that result from reaching the limits of decimal precision in calculations. // We have tests that demonstrate this.